Over the years that Victoria Sweet has been a physician, “healthcare” has replaced medicine, “providers” look at their laptops more than at their patients, and costs keep soaring, all in the ruthless pursuit of efficiency. Yet the remedy that economists and policy makers continue to miss is also miraculously simple. Good medicine takes more than amazing technology; it takes time—time to respond to bodies as well as data, time to arrive at the right diagnosis and the right treatment. Sweet knows this because she has learned and lived it over the course of her remarkable career. 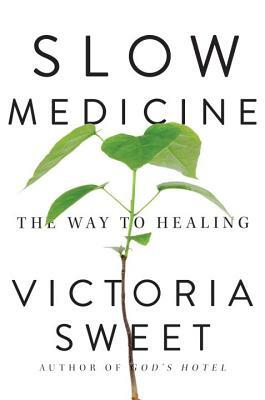 Here she relates unforgettable stories of the teachers, doctors, nurses, and patients through whom she discovered the practice of Slow Medicine, in which she has been both pioneer and inspiration. Medicine, she helps us to see, is a craft and an art as well as a science. It is relational, personal, even spiritual. To do it well requires a hard-won wisdom that no algorithm can replace—that brings together “fast” and “slow” in a truly effective, efficient, sustainable, and humane way of healing. Victoria Sweet was a physician at San Francisco’s Laguna Honda Hospital for more than twenty years, an experience she chronicled in God’s Hotel: A Doctor, a Hospital, and a Pilgrimage to the Heart of Medicine. An associate clinical professor of medicine at the University of California, San Francisco, she is also a prizewinning historian with a Ph.D. in history and social medicine, and the recipient of a Guggenheim Fellowship.